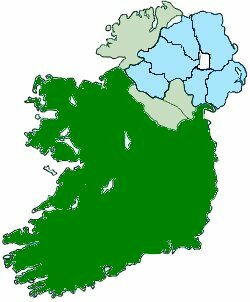 In ancient times, the extension of Ulster was determined more by the presence of the Ulaid (i.e., the people of Ulster) than any geographical boundaries; this observation applies, of course, to all the geographical divisions of Ireland in ancient times. Louth, Monaghan, Armagh, and Down were all certainly part of ancient Ulster; as one moves away from this area, the identification becomes more and more vague. The ancient capital was Emuin Machae (var. Emain Macha), which was located near the town of Armagh (approximately two miles west of the town at Navan Fort). The term "capital" does not mean an administrative or legislative center but was the more-or-less permanent site of the royal residence. Among the legendary persons or groups most prominently associated with Ulster are King Conchubur (var. Conchobar, Conor mac Nessa), Cï¿½ Chulaind (var. Cï¿½ Chulainn), the important warriors Conall Cernach and Loegaire Buadach, the troublemaker Bricriu Nemthenga (Bricriu of the poisonous tongue), a one-time king of Ulster, Fergus (the name means manly force), who resigned in favor of his wife's (Ness) son (Conchobar). Fergus also was a foster father of Cï¿½ Chulaind.